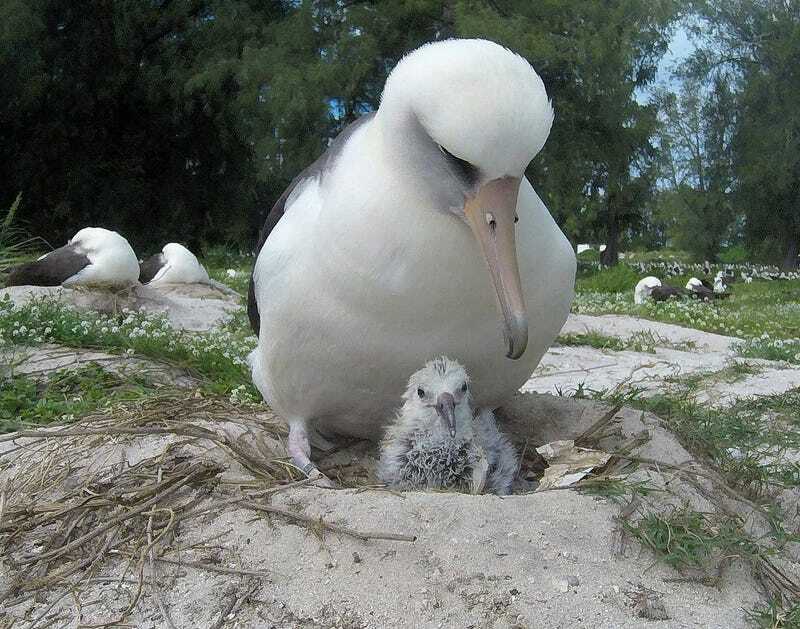 Wisdom, a 68-year-old Laysan albatross and the world’s oldest known wild bird, has successfully hatched a chick, according to the US Fish and Wildlife Service. You know what that means: she still fucks. No, the male bird does not stick his bird dong into the egg. Instead, both male and female birds have cloacas, openings that lead to their reproductive organs and from which they expel waste. During mating season, the cloacas swell, the female moves her tail feathers aside, and the male rubs his cloaca against hers. Then, she lays a fertilised egg from which a chick hatches. In this case, Wisdom’s mate Akeakamai did the rubbing. Finding a mate can take a long time for an albatross. Usually, they begin looking as juveniles, practicing courtship dances until they find the right mate. Pairs typically stay bonded for life. Biologist Chandler Robbins first banded Wisdom on Midway Island in 1956. She was an adult, implying that she was at least six years old. He spotted her again 46 years later, confirming her identity with the number on her band. At 68 years old now, she is the world’s oldest known wild bird, though there might be an older unbanded bird out there. Wisdom continues returning annually to the Midway breeding site to get it on – Wisdom and Akeakamai have hatched an egg every year since 2006, according to a USFWS blog post. No update as to what the chick has been named, but we’ll update the post when we find out. Albatross parenting isn’t easy: The USFWS says the birds lay only one egg at a time, which the parents then take turns incubating for over two months. It takes another five or six months for the chick to be ready to head out to sea. Midway serves as an important habitat for the birds – 70 percent of Laysan albatrosses use it to raise their young, as do other species of albatross and birds more generally. That makes the land an important conservation target. Anyway, here’s to Wisdom. Nice work.